Nicolas, A.N. and Plunkett, G.M. 2009. 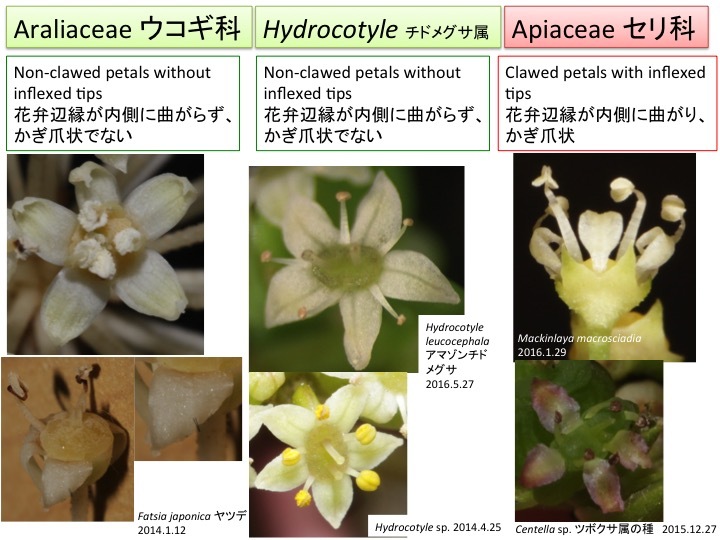 The demise of subfamily Hydrocotyloideae (Apiaceae) and the re-alignment of its genera across the entire order Apiales. Molec. 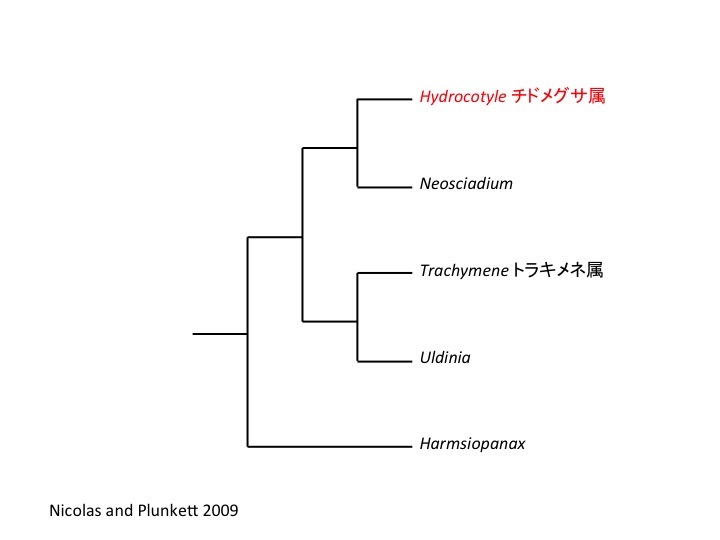 Phylogenet. Evol. 53: 134-151. 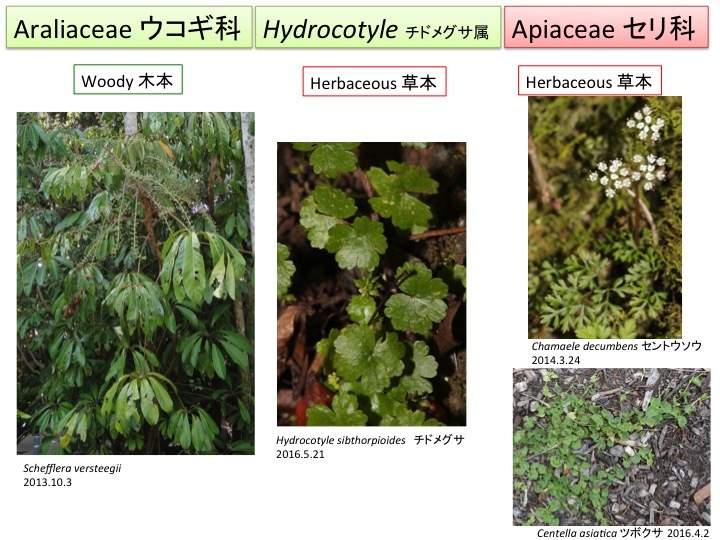 Hydrocotyle and its close relatives have been treated as a member of the Apiaceae but phylogenetic analyses using nucleotide sequences support the inclusion in the Araliaceae (e.g. Nicolas and Plunkett 2009). Nicolas, A.N. and Plunkett, G.M. 2009. 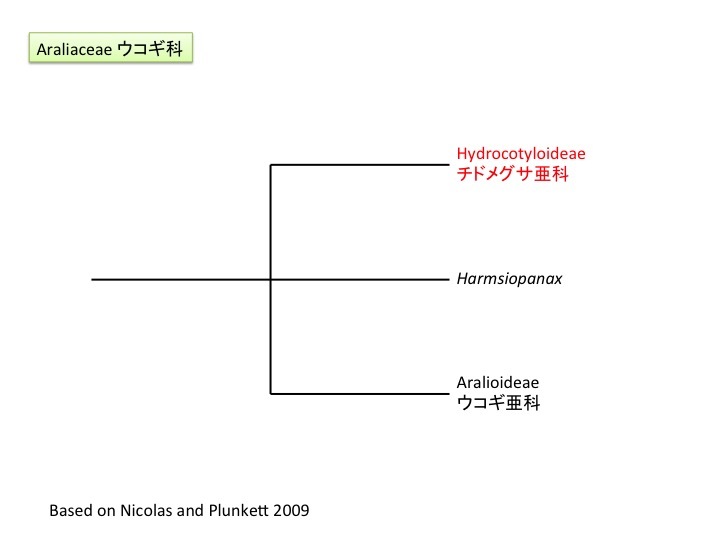 The demise of subfamily Hydrocotyloideae (Apiaceae) and the re-alignment of its genera axross the entire order Apiales. Molec. 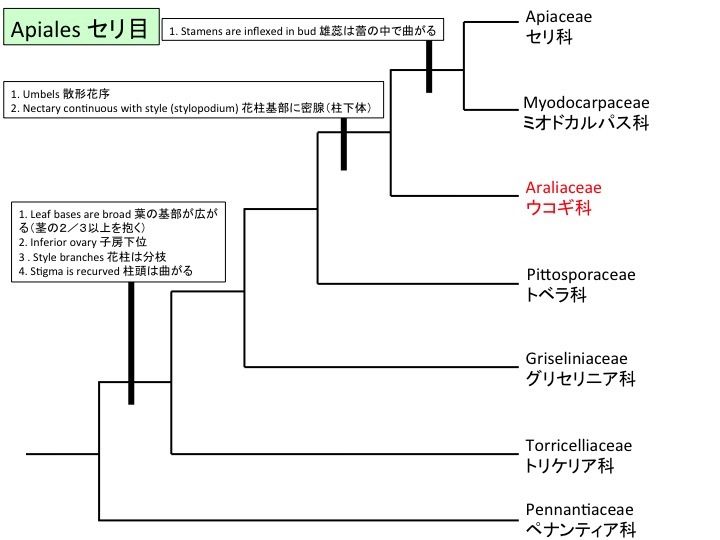 Phylogenet. Evol. 53: 134-151. 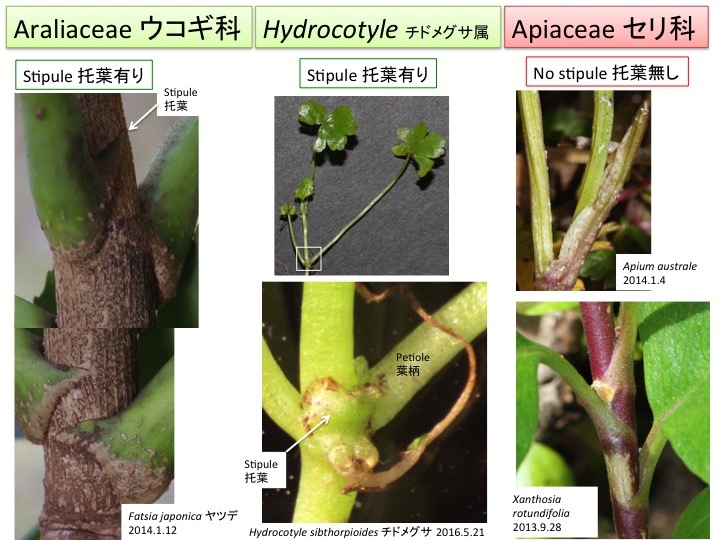 Hydrocotyle shares some morphological characters with the Araliaceae but other ones with the Apiaceae. 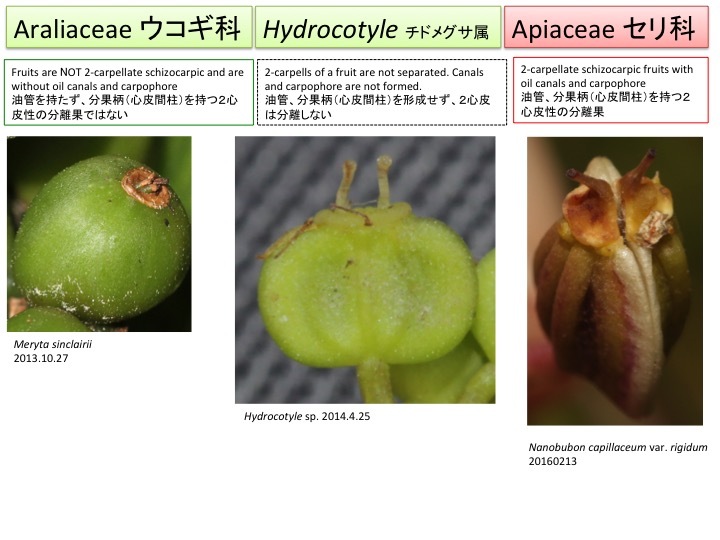 Morphological characters of Hydrocotyle are indicated as plus marks. 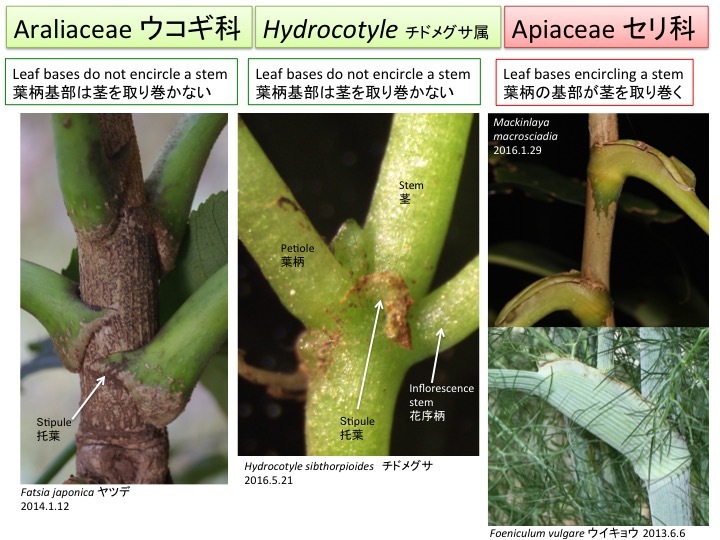 When Hydrocotyle has intermediate morphology, plus mark is shown on the dotted line. Stipules of Fatsia japonica is connate to a petiole. 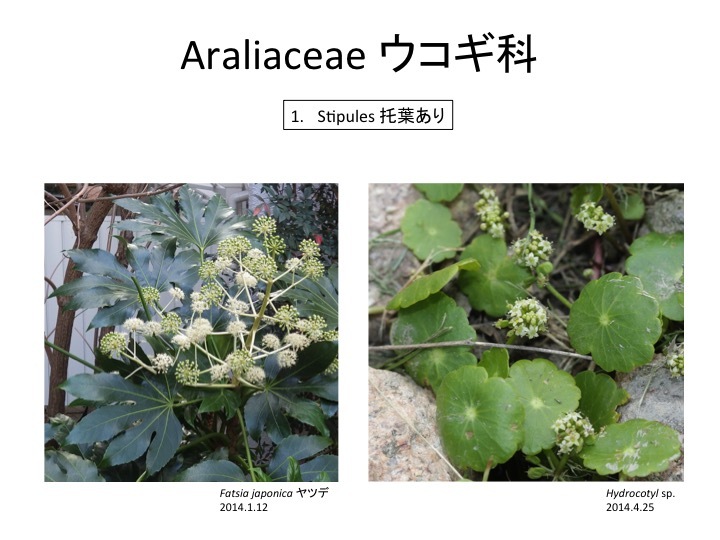 The Araliaceae are mostly composed of woody species, while the Apiaceae are of herbaceous species. 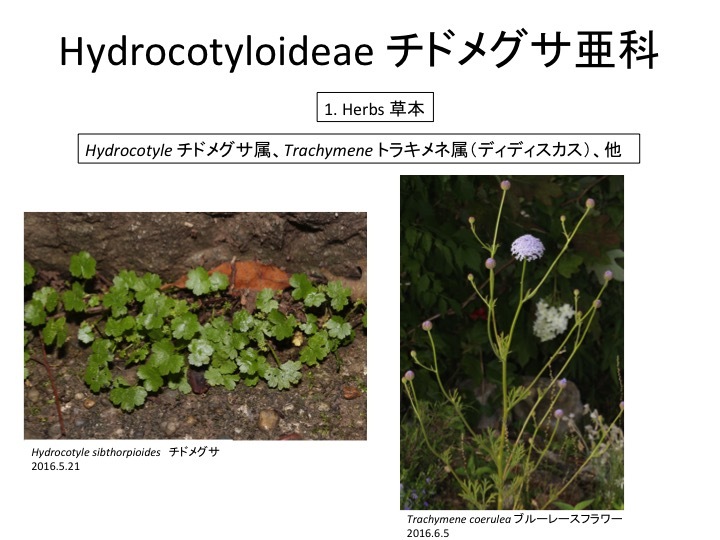 Hydrocotyle is herbaceous. Stylopodia at the base of styles are connate in the Araliaceae, but are not connate in the Apiaceae. 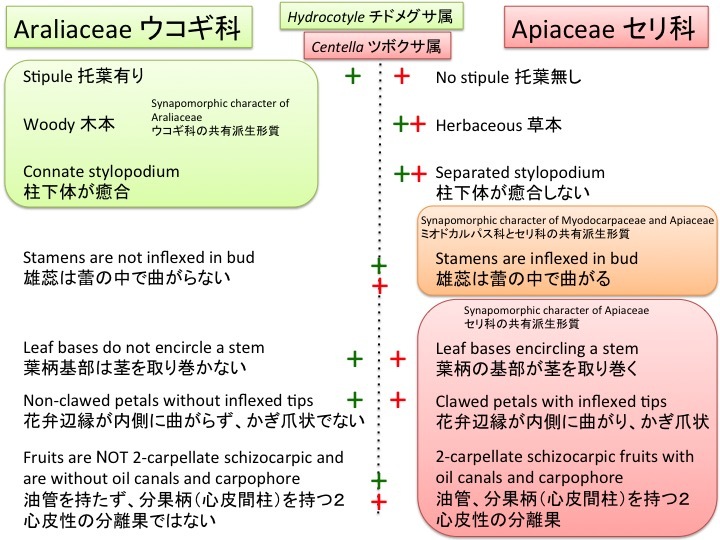 Stylopodia of Hydrocotyle are not connate as that of the Apiaceae. 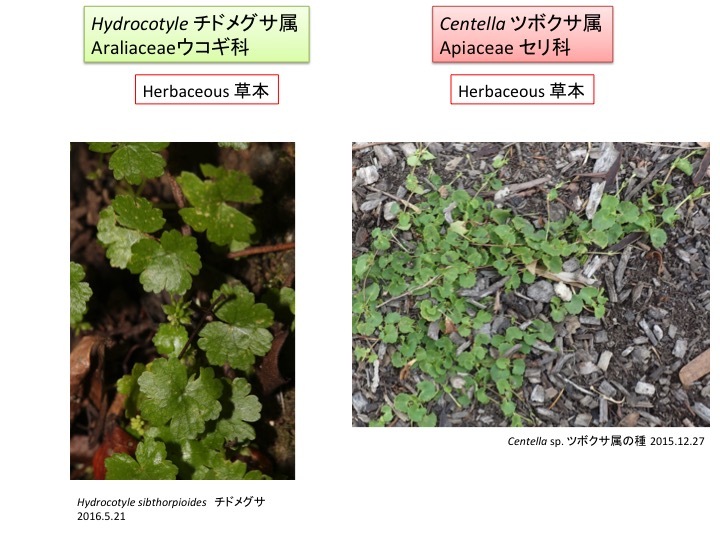 In addition, Centella in the Apiaceae is similar to Hydrocotyle. 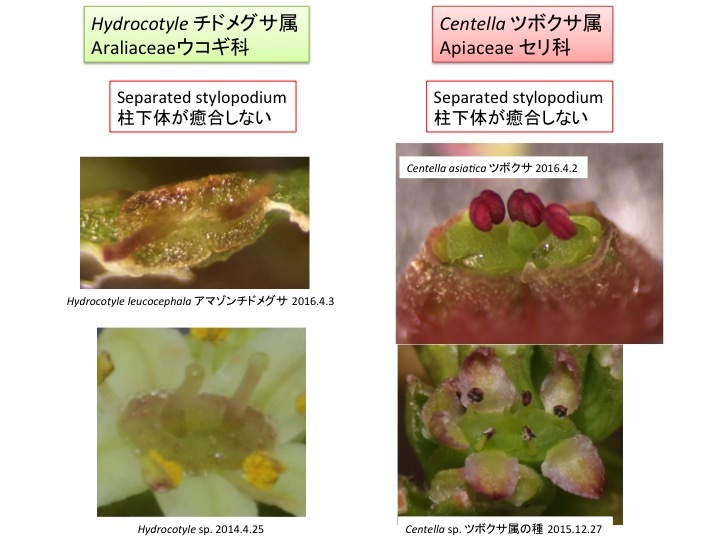 Morphological characters of Centella and Hydrocotyle are shown as red and green plus marks, respectively. Stylopodia are not connate in both species, but position of styles are different between them. 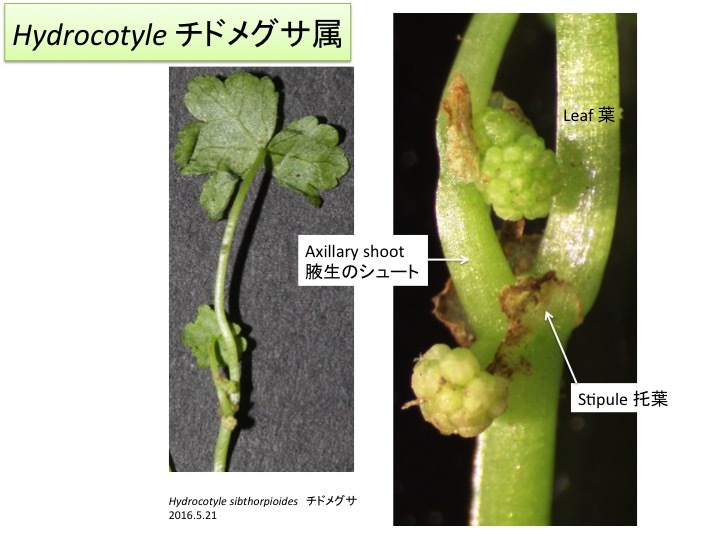 Styles are positioned at the center of each stylopodium in Hydrocotyle, while they are positioned at the border of two carpels in Centella. 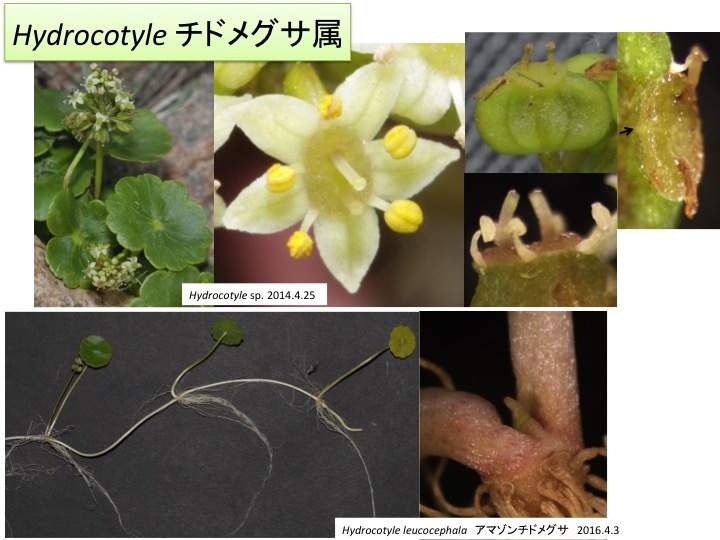 Petals of Hydrocotyle and Centella are similar to those in the Araliaceae and the Apiaceae, respectively. Stamens of both genera are slightly bend and intermediate between both families. 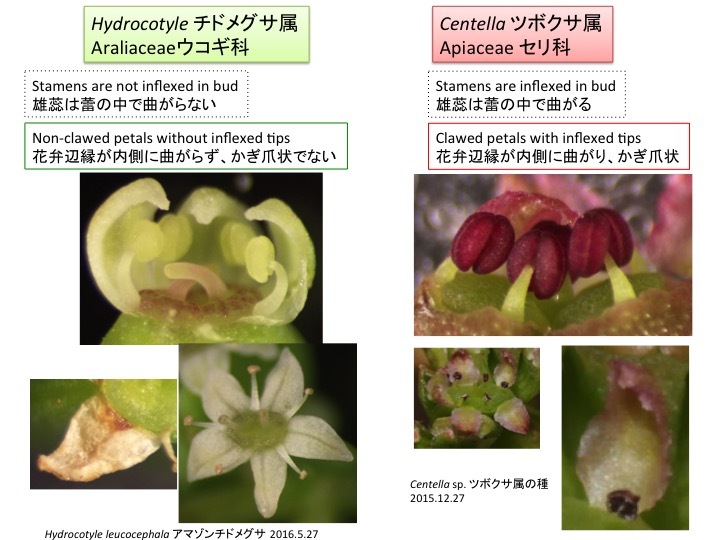 Morphology at the leaf base and stipules is different between two genera. 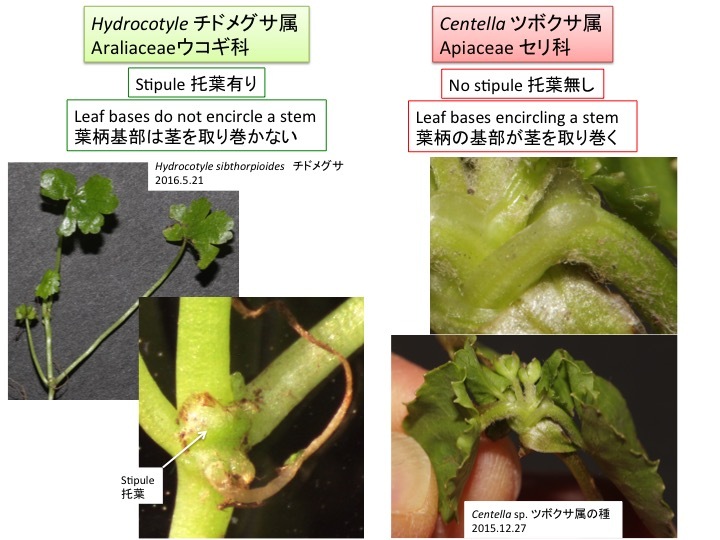 Furthermore, Hydrocotyle and Centella share the following three special morphological characters that are not popular in both Araliaceae and Apiaceae: 1) the creeping stem, 2) adventitious roots from nodes, and 3) axillary inflorescences. Therefore, Hydrocotyle was classified into the Apiaceae. 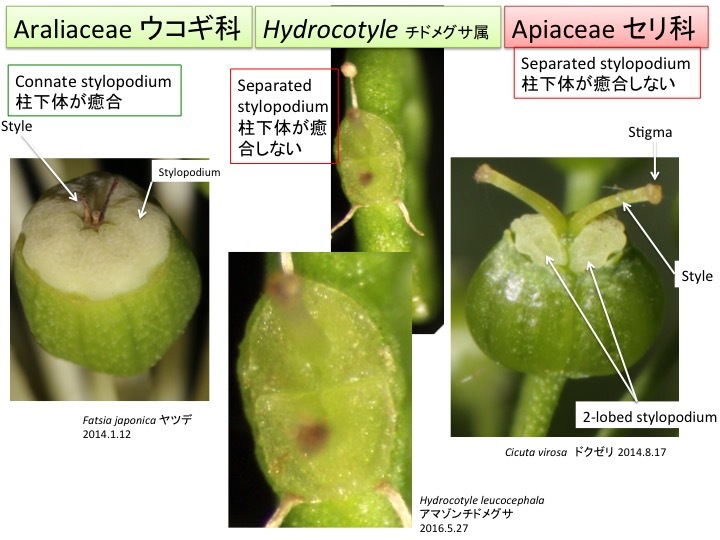 However, with careful observation, inflorescences of Hydrocotyle are not axillary. 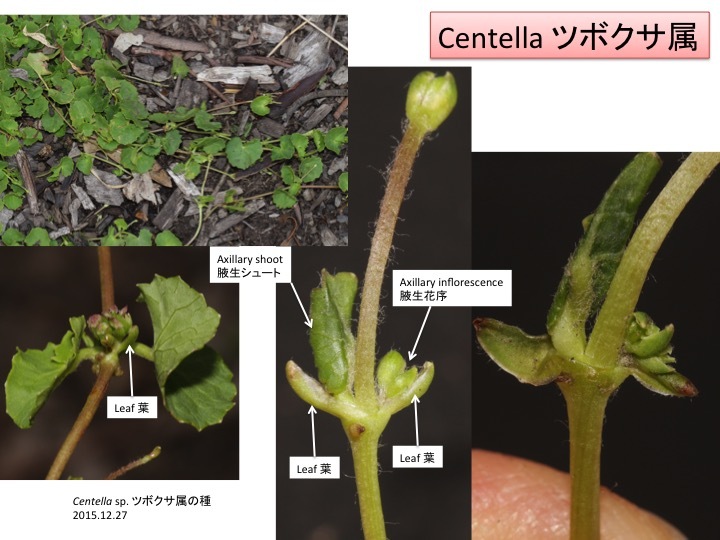 Inflorescences of Centella in the Apiaceae are axillary. 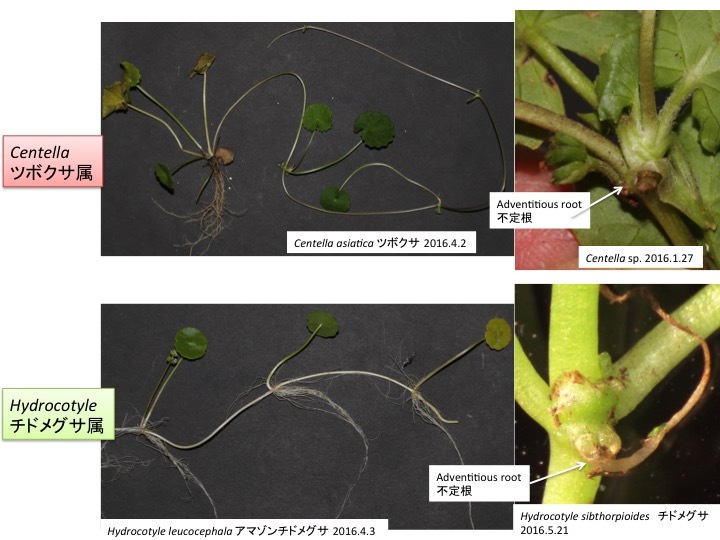 The creeping shoot is monopodial. 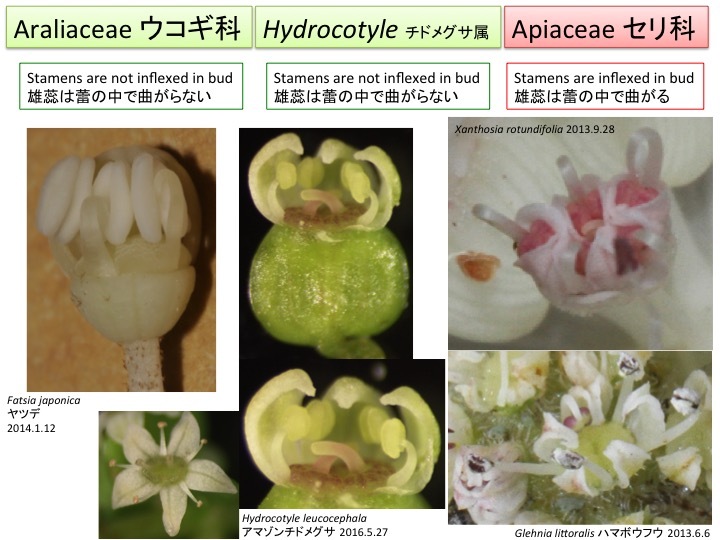 An inflorescence of Hydrocotyle leucocephala is not formed at the axil of a leaf but rather in an opposite position. This suggests sympodial branching, in which an inflorescence is a terminal shoot and an extending vegetative shoot is an axillary shoot of a leaf. In the right picture, a secondary axillary shoot is formed between a main axillary shoot and a leaf. 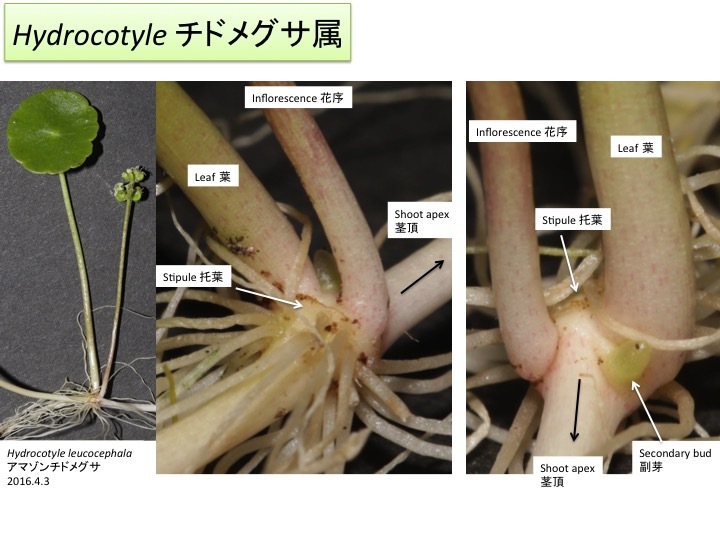 Sympodial branching is also observed in Hydrocotyle sibthorpioides.